Bullnox Androrush by Betancourt Nutrition is without a doubt one of the best pre workout supplements you can buy. You will find countless Bullnox pre workout reviews scattered all over the internet, and most of them say pretty much the same thing. Such a good pre workout, great pump, next level performance etc etc. So why bother to do another Bullnox pre workout review? Good question. I guess that like countless others I have been so profoundly affected by this product over the years that I feel the need to declare my love of it in a public arena. More importantly though, I am interested in what it is that actually makes this product so good and by writing a review I am formalizing the acquisition of this knowledge. Like so many others, I first stumbled upon this pre workout supplement by chance. I had often seen it in supplement stores (the large container certainly differentiates it from most of the other pre workouts on the shelf) but had never really given it much thought. One day I was passing by a supplement store and thought I’d have a look to see if there were any new products. As usual, there weren’t. I liken this activity to opening the fridge and looking around at the food inside. We know what’s in there as there’s a very good chance it hasn’t changed in the 5 minutes since we last looked but we like to have another look anyway. So this day was just like most other days and there was nothing new on the shelf. It was actually the sales assistant that suggested I consider trying Bullnox. The main thing that sold me on it at the time was the relatively low caffeine content. I wanted a stimmed pre workout but not too much caffeine. As it turns out, Bullnox was perfect for me in not just that but also many other ways. In addition to that, Bullnox is using Carnosyn which is a patented and more effective form of Beta-Alanine to really increase the amount of work your muscles can do before fatigue sets in. Also helping with this is Taurine and Glucose which is where most of the 50 calories come from. Neural Energy – I like the energy I get from Bullnox, it is long lasting and doesn’t make me jittery. We can only infer from the ingredient list that the proportions are just right. Anhydrous Caffeine, N-Acetyl-L-Tyrosine and Guarana are pretty standard stimulants that you will find in most stimmed pre workouts. The Citrus aurantium extract which you may know as Bitter Orange or Synephrine is a less common but very effective stimulant which is often used by bodybuilders as part of their supplementation routine. These things work well together especially when combined with the Glucuronolactone which works synergistically to increase endurance and further offset fatigue. 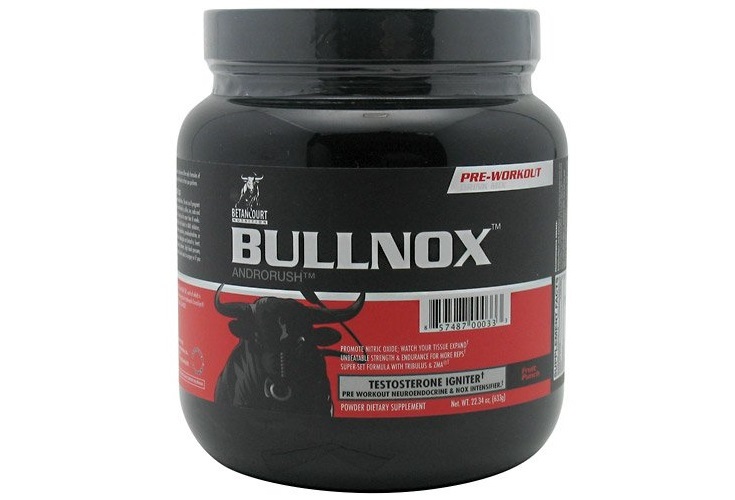 Nitric Oxide – If pump is your thing then Bullnox is for you. In my opinion this is the number one feature of this pre workout. 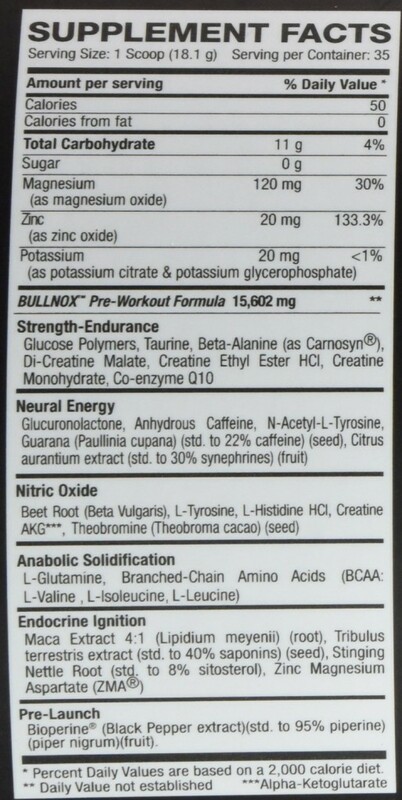 None of these ingredients are by any means unique to Bullnox but based on the pump this pre workout gives you there must be far greater amounts present than in any other product. Skin-tearing and vein-popping are two expressions that spring to mind here. Bonus trivia – Theobromine is the chemical present in chocolate that activates the feel good receptors in your brain. Anabolic Solidification – This is a marketing masterpiece! To me this is fantastic work by someone in the Betancourt marketing department as it sounds great and also gives a reasonable description of what these ingredients do. The BCAAs (L….ines) and the L-glutamine are there to support the anabolic processes and maximize protein synthesis and muscle growth. You don’t feel any immediate effects from this but you should notice an improvement in your recovery and hypertrophy compared to not using it. Endocrine Ignition – Another touchdown by the marketing department and a huge differentiator between Bullnox and the competition. 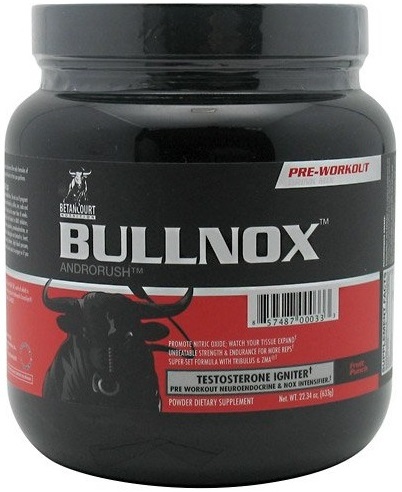 Bullnox is the only pre workout I know of that includes a legitimate testosterone boosting component. Some other pre workouts claim to have test boosting properties but Bullnox actually has scientifically proven ingredients. Value plus. Pre-Launch – About time the marketing team had a fail. I don’t see how ‘Pre-Launch’ is relevant here at all. 2 out of 3 ain’t bad though. Studies have shown that Black pepper extract or ‘Bioperine’ can help increase absorption of nutrients by boosting gastrointestinal function. It is also purported to help increase metabolism, particularly of fats. Apart from becoming massively swole, there aren’t really any side effects particular to this pre workout that I noticed. As with all stimmed pre workout supplements you should watch your hydration levels and take care not to become dehydrated. This is due to the high amounts of caffeine most of them contain, which can have a strong diuretic effect. So make sure to drink enough water! Pump – This has got to be number 1 as it really gets the blood flowing unlike any other pre workout I’ve tried. See what happens when you take 2 scoops – I dare you! Performance – In terms of strength and endurance boosting, Bullnox is a high achiever. People consistently report the ability to lift more weight than usual, more times than they usually can. Recovery – The solid serving of BCAAs really seems to help speed up recovery and reduce soreness which is a big plus, especially after leg day! Test booster – This is a great inclusion for anybody looking to gain strength and muscle mass – well done Betancourt. Taste – You’ll be hard pressed to find a negative word about the taste of any flavor and I think the Blue Raspberry is one of the nicest drinks I’ve ever had. Check out my pre workout supplement reviews page. Really good stuff, it was both and informative and helpful. Used to use pre work out, but was told of the dangers of such a high caffeinated diet, but i think it is all in moderation – and being smart with your supplements. It was quite a long post, so i might want to add some links to go through to the particular titles though. I didn’t understand some of technical words used, so i had to google them – but got there in the end haha. Keep up the good work, it is clear you have an in-depth knowledge on the topic. Thanks a lot Tyler, all the best! I used to drink preworkout and experiment with different kinds but I found they all made me jittery and actually affected my workout negatively. As you say, this one doesn’t cause the jitters so that’s good. I’m looking for that pump without becoming a wacko haha. I’m definitely in need of faster recovery as well. Hi Gina, that jittery feeling you’ve experienced with other pre workouts is most probably due to high caffeine content. Bullnox is good in this regard as it has less caffeine. Happy training! Love your post, you have a great way of explaining things,a way in which I could even understand 😉 .. I was just wondering however I have heard some pretty scary stories about using similar products, one was the product made a mans pectorals grow so big they looked like breasts, can this actually happen? Thank you for sharing this article with everyone, I know I have found some great value within it, I have no doubt anyone else would have to. I don’t think that a man’s pecs could end up looking like breasts purely from taking pre workout. I’ve heard of men developing small breasts in rare cases when their estrogen levels are very high but taking this pre workout would definitely not cause that! Happy lifting! Pingback: What's your pre workout routine? The good old pre workout formulas, I used to love jack3d but authoritys ban every time i get to like one! As far as I know there are no ingredients in Bullnox that would cause it to get banned. I hope not anyway as it is one of my favorites! I could not see anything like aspartame in the ingredients list, so I think you’d be fine to take Bullnox if you’re worried about artificial sweeteners. It looks like it does work. You mentioned that you will get a good pump and that is what I am looking for. I also like that it help with recovery to repair the muscles. When I buy pre-workouts I want them to taste good and this pre-workout looks like it tastes amazing. I am going to buy this pre-workout and give it a try. Betancourt has NEVER released the amount of caffeine in Bullnox! Ugh. Smh. Ugh indeed! “Proprietary blends” are so annoying!